On 30 October 2017, the Nobel Prize Dialogue was held in Seoul. Five Nobel laureates, key opinion leaders, policy makers, students, researchers and the general public met to discuss The Age to Come, exploring the challenges with an ageing population. 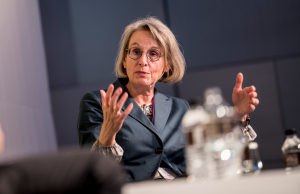 Ursula Staudinger moderated the panel discussion “Priorities for the Ageing Population”, discussed with other panelists about “Attitudes to Ageing” as well as “Mobility and Cognition”, and held the Key Note “The Positive Plasticity of Human Ageing”. “We are able to modify our development, our own aging process,” she said in her talk. Staudinger explained ageing as a multilevel dynamic system, in which context (e.g. institutions, societal environment), person (e.g. behavior and attitudes) and biology (e.g. genetic endowment) continuously interact with each other. It was this interactive nature that created room for plasticity and therefore the modifiability of human ageing, she said. To demonstrate the modifiability of aging, Staudinger shared some impressive scientific evidence on the cohort improvements in cognitive functioning. The implications of it are that the UK population, for instance, will be more cognitively apt respectively more intelligent in the year 2042 than today, even though it has an ageing population. “Ageing and old age can be quite different, if we decide to make use of its potential,” Staudinger said and emphasized that we all have a considerable responsibility in this respect. “This will not happen by itself,” Staudinger stated, “it is requiring major efforts on the societal part as well as individual parts.” Thus, it will be essential to implement cognitive training “in vivo” by integrating more challenges in everyday situations e.g. task changes at work. Moreover, Staudinger argued that in order to move aging science further, it was necessary to bring together the various scientific disciplines concerned with the aging process. Packed with lectures and panel discussions on various issues of aging, the event is part of the annual Nobel Week Dialogue organized by Nobel Media and the Nobel Center Foundation. The main one-day program is slated for 9 December in Gothenburg, Sweden. The Seoul forum was organized in partnership with the Korean Academy of Science and Technology.